Bridge crossing river d'Ebre, Catalonia. The longest suspension bridge in the world connects Honshu to Shikoku, Japan. For other uses, see Bridge (disambiguation). A bridge is a structure to cross an open space or gap. Bridges are mostly made for crossing rivers, valleys, or roads. 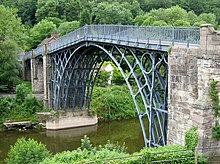 Nowadays most big bridges are made to carry vehicles but people have also walked across bridges for thousands of years. Bridges called highway overpasses carry a road over another road. Military bridges are portable, so that they may be easily moved to where they are needed. This makes them much more complex than most civilian bridges. The first man-made bridges were probably made from cut wood or stones. ↑ "Beam bridges". Design Technology. Retrieved 2008-05-14. ↑ Glass, Amy. "Dubai to build world's longest arch bridge". Arabian Business. Retrieved 2008-05-14.